and now the water is cloudy with some white pieces in it, not matter how many tanks I flush away! I don't believe the brew head is dirty my machine is quite new! I changed the water, did everything I could. however the water from the milk frothed is not as cloudy.. it's almost clear. Anyone knows how to solve this? please not that no pro. near by. So I can't take it to someone and fix it. How did you decide that it needed descaling? Acid + metal = ?? Citric acid is not an accepted descaler for anything other than espresso machine parts in a bucket. It can and does cause damage to aluminium boilers, solenoids, gicleurs and it's a definite no go for HX/Dual boiler machines. How to solve it? Flush a heap and hope you haven't done too much damage. It's always a good idea to be sceptical of what you read on the internerd. Way too much of it is rubbish! Dimal and GreenBeanGenii like this. yeah but I read so many people said that they use it and never had any problem with it. Too bad, I guess the machine is damaged now..
Hi Sarah26! What is your maintenance routine for your Gaggia Classic? Do you backflush? Have you tried removing the shower screen and dispersion plate and cleaning them manually? You seem to suggest that the water coming out of the frother is cleaner than the water from the group head. Do the cloudy water eventually clear up when cooled? Well no it doesn't clear up, the shower screen looks shiny and clean as I said I've been using it for less than a year. I tried unscrewing the shower screen but its STUCK no matter how hard I try. Would you suggest I back flush? Hello Sarah, I doubt that you have seriously or permanently damaged your Gaggia. Citric acid is a relatively mild organic acid and is in fact used in numerous proprietary de-scalers. One very well known brand contains 60% citric acid. The cloudy water is probably dissolved scale and the white pieces are bits of scale. Just keep flushing until the water runs clear. That's what I thought, but I flushed around 10 tanks now, would it take that much? should I try back flushing? Yes- the other components are used to break up plaques of scale that those who use it neat find fouling solenoids, gicleurs etc. We pick up the pieces frequently and I can assure you that 40% matters. 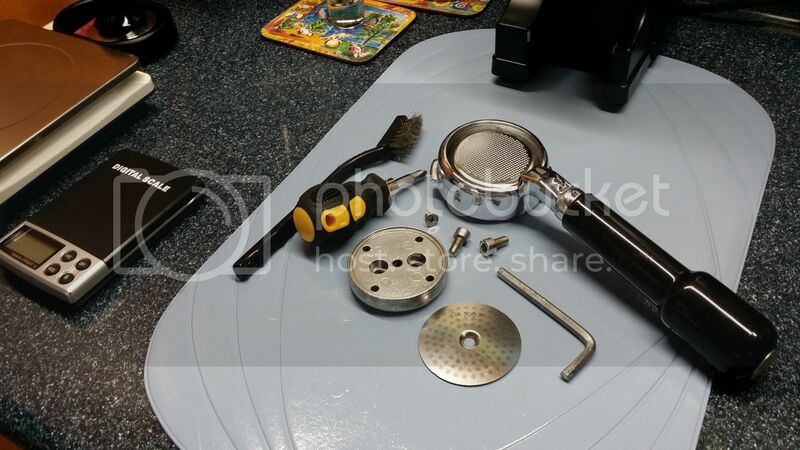 I suggest you remove both shower screen (#2 Phillips head screw driver) and the dispersion plate (5mm Allen wrench) before you do anymore flushing.You can remove the water reservoir and put the Gaggia Classic on it's back for better access to remove the 2 parts. As pointed out by others, what you see in the water are bits of scale. What type of water do you use? Are you in a hard water area? Last edited by JojoS; 31st August 2015 at 11:12 AM. Hi Deegee, That's what I thought, but I flushed around 10 tanks now, would it take that much? should I try back flushing? That's puzzling, 10 tanks is a lot of flushing, and I would have thought that would be more than enough to remove all the citric acid and dissolved / loose scale from your machine. I also wonder why the water from the steam wand is relatively clear, it's taken from a bit higher in the boiler than the water that goes through the brew head, but not much. There is a slight risk in doing a back flush while there are still some solid pieces of scale in the system. They could block the passage in the brew head, or the solenoid valve. I don't think that it is likely to solve the problem anyway, so probably better not to, though if the water was just cloudy with no solid bits, it would be OK .
Are you allowing the water to heat up in the boiler before flushing, or just pumping cool water through the boiler without bringing the machine up to brewing temperature ?. To be honest, I don't know if that would make much difference, but it could be worth trying. It may be that the boiler needs to be heated then cooled a few times to help remove all the scale that has been loosened but not fully dissolved by the citric acid. If the cloudy water is more severe from the group head than from the steam wand, it is likely that the space between the boiler base and dispersion plate and the space between the dispersion plate and inner side of the shower screen is coated with scale. Best to do manual cleaning on this 2 parts as well as the base of the group head. Do not backflush until then as it can just mess up your 3 way Solenoid. Thanks everyone, I will do so and hope it works. Here's what the inside of your Classic probably looks like (image of a Via Venezia I was working on that was not de scaled nor was softened water used in the tank - very similar to the Classic boiler in water flow respect). Please note the upright copper tube in the centre of the boiler: when you press the button to extract espresso and the pump starts it forces water into the boiler which displaces the hot water which flows down that tube. You can see how challenging it is to flush the scale out which like to sit on the bottom of the boiler! Oops! My bad - that's actually a Gaggia Classic boiler I serviced (I just throw the VV's away now ... so that's what yours looks like inside I'm guessing. Not sure if it's damaged or just dirty.. however I started to see very small brownish things in the water when I flush it. It's just dirty. Give the shower screen and dispersion plate a good scrub. If you're feeling adventurous, are even slightly handy, and are out of warranty, have a go at pulling it apart for a deep clean. I did this on mine the other week after owning my machine for 9 years or so, with the odd service here and there. Getting some of the parts apart was.... interesting. But I managed to do it without damaging anything critical. Gave it all a good soak in descaler and manually cleaned before putting back together. Lots of videos on youtube to guide you. That said, occasionally I get cloudy water after a back flush, but it usually runs clear pretty quickly. Apart from Tartaric Acid I would love to know what the other 40% is. The "Balance" would appear to be less than 30-35%. Most domestic products are mostly citric acid with some other acid in small quantities (Tartaric, lactic, sulphamidic acid, maleic acid). Commercial product use the big gun of phosphoric acid. Aluminium sulfate <1% - not sure of the purpose. It is a flocculating agent so maybe helps keeps things (floc) in suspension to remove particles. I am in no way suggesting that people mix up thier own descaler with any of those additives, but it is interesting to know of some of the things put in these products. GreenBeanGenii and TC like this. I wasn't suggesting people expose their boilers to concentrated sodium hydroxide. I also wouldn't suggest they expose it to concentrated citric acid, but a correct mixture of the two would be harmless. HCl and NaOH sound nasty but 1:1 they make table salt. Thing is not many users on a Coffee forum would have any inkling of the amphoteric properties of aluminium. Abuse of aluminium could be far worse than any portafilter sneeze. I wouldn't be encouraging anyone to experiment and try to create a home-brew descaler just because of something they've read in a forum. Much easier, safer and simpler to go with either propriety ready-made compounds from Cafetto or similar, or the weak citric acid solution that a lot of people have been using safely (although not necessarily efficaciously) on their home machines for many years. Fair enough Mal, I don't want anyone to damage their machine, I'm just of the opinion that openly discussing ideas and sharing information can only be a good thing. People are already abusing their gaggia boilers with citric acid, which at least outside of this forum, appears to be the standard remedy. While there might not be any immediately noticable damage it can certainly cause corrosion over the long term. Some commerical solutions aren't suitable either, nor is your standard backflush powder. My Cafetto proudly states on the back it follows "NSF protocol P152... not corrosive to the espresso machine...", well stick your aluminium shower plate holder in it and see what happens? Once I discovered this first hand I posted it up and saw other users state the same thing - I would have rather read about it first before drinking the first few layers of my backplate. Anyway enough for now, all I'll suggest is that people only use cleaning products which specifically state they are safe for aluminium - don't assume otherwise. Regardless of what you use, make sure you flush it liberally with water after. Dimal, Buzzbard and mulquemi like this. Ugly, but reminds me of older Gaggia's that I have pulled apart to fix. I not sure that is scale. I have personally assumed that it is corroded aluminium for the upper boiler. I you pull everthing apart it is easy to clean out and fix. However you will need to replace o-rings. If you do open them force water through all the orifices to clean them quickly. I'll stay out of the acid treatment subject but will add that a small amount of baking soda added to warm water will neutralise the corrosive action of malic and citric acid. I bathe boiler parts in this solution after an acid bath; then a good rinse in warm water before reinstallation. JojoS and mulquemi like this. Interesting suggestion but how small an amount? 1 tablespoon diluted to 1 liter of tepid water? If so, it will be perfect for initial rinse after descale. It depends on how much acid is there. Adding more than you need wont be a big deal, provided you rinse it well afterwards.